Just a quick update while I’m moving house; the background for the photographs below is actually my newly dedicated Napoleonic section in our library! Work is still underway on the whole move and I haven’t been able to do much painting in the meantime, but by next week everything should be in order. Apart from my elbow, that is – still suffering. Models by Perry Miniatures; plastics with a metal command set. It’s a bit of a mixed bag, this unit. 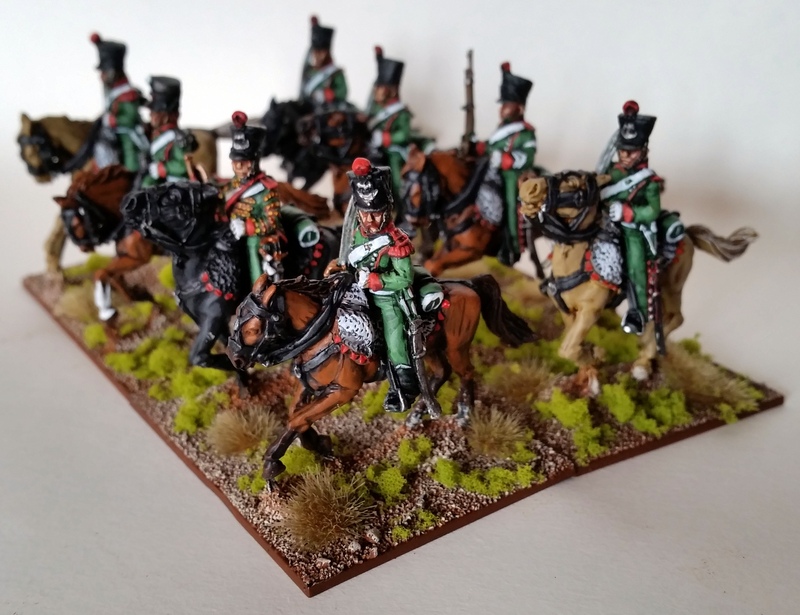 Most of the greatcoated models are second-hand pieces which I received in return for painting my friend Kurt’s Dragoons and Cuirassiers a long while back. I kept the models in my pile until now as they were dreadfully mangled by thick white undercoat spray. Still, I managed to paint them up despite the loss of detail and I don’t think it’s all too apparent (at least, not in the pictures!). The command set are metal models, and I’ve added a sapper to spice things up a bit. Burly man in a bearskin and an apron wielding an axe = awesome. A close up, rather unfavourable to my brush skills! Less models to paint, you see. That’s it for now, though! I have another line infantry battalion in the works, these will be for the 108th, but it’ll probably be a while before they come ’round the bend. I have plenty of commissions going and considering my fractured elbow… Anyway, we’ll see. Up next are probably some more Prussians! As said in my previous post, these guys were worked on painstakingly – not the detail I lavished them with, but the fractured elbow made it so! I went to the Waterloo bicentenary reenactment, and it reminded me I really had to get going on some Cuirassiers. Here we are then! Models by Perry Miniatures, mostly plastic with a metal command set. I mixed a metal command set in with plastic troopers, and I did convert the standard bearer into a regular trooper by putting a sword in his open hand. Not a perfectly executed conversion, but it gets the job done (he’s the one in the front left). Plenty of dynamic posing to be done with these chaps. For the horses I used a range of coloured sprays from GW and Army Painter, whereas I used a blue undercoat on the troopers, with the exception of the musician who received a green one. There’s not much uniform colour on these guys, but by now I’m used to this kind of process so why change it. Plenty of detailing after that, but nothing too special. 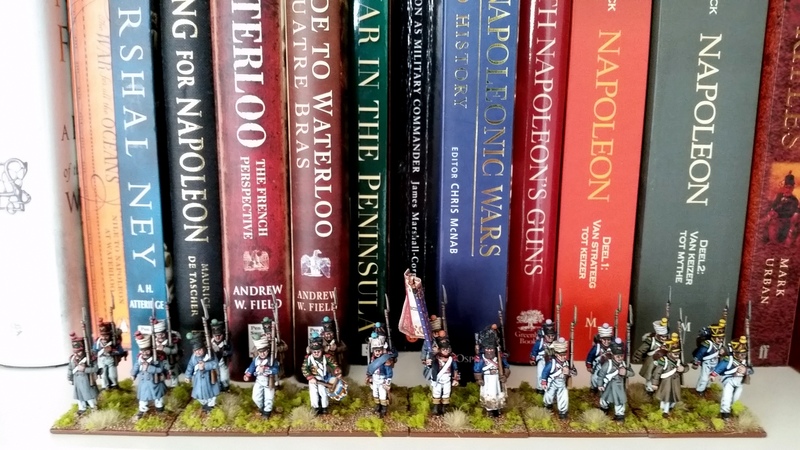 I painted them up as the 8th regiment, which was really my only choice for the unit; the other which is mentioned in the Quatre Bras OOB, the 11th, allegedly fought without their cuirasses. 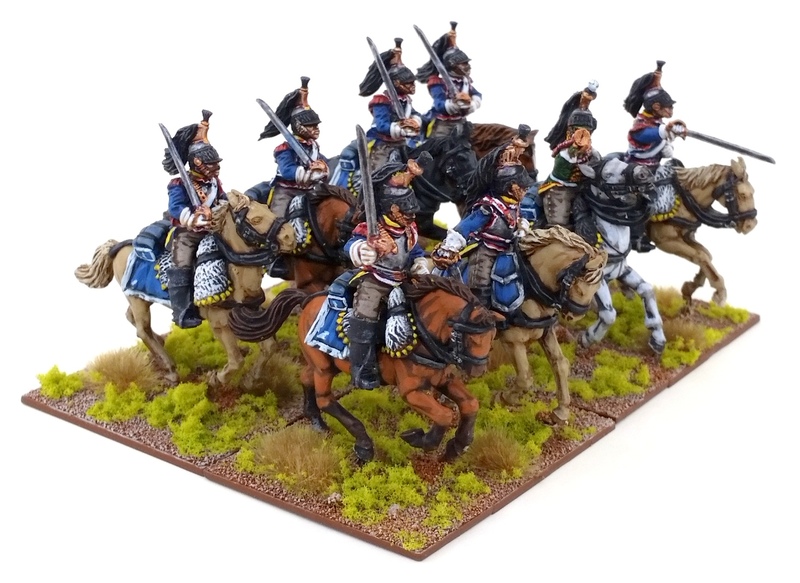 If anyone can point me to suitable cuirassiers-sans-cuirasse models, please tell me in the comments! These lads here proved murderous in our last battle with the Waterloo Warhammer Historical ruleset; I split them up into two separate smaller units and one rode down a Redcoat battalion in line while the other smashed a British Dragoon unit to pieces. C’est magnifique! 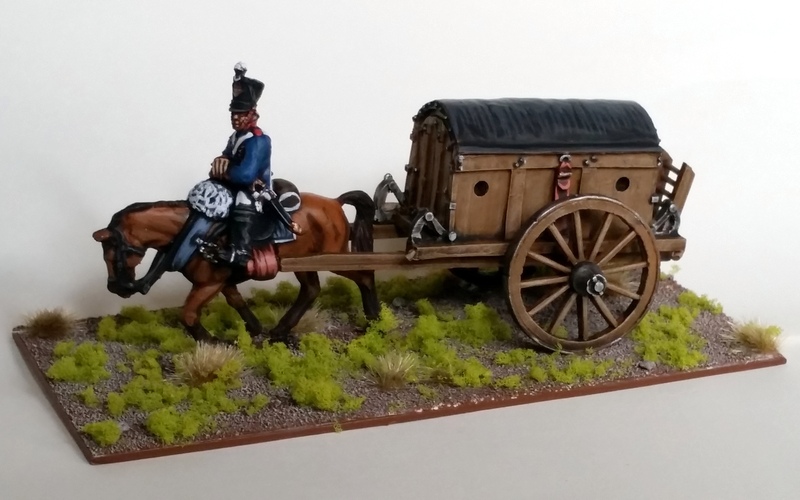 That’s it for now – more Napoleonics close around the bend. 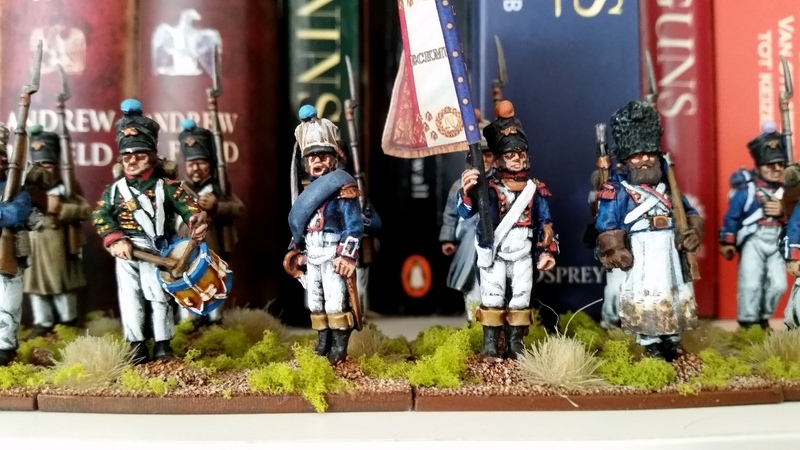 I’ve completed some Prussian fusiliers for my friend Henk, and I’ve finally based a fifth line regiment for my French. Stay tuned, citoyens! 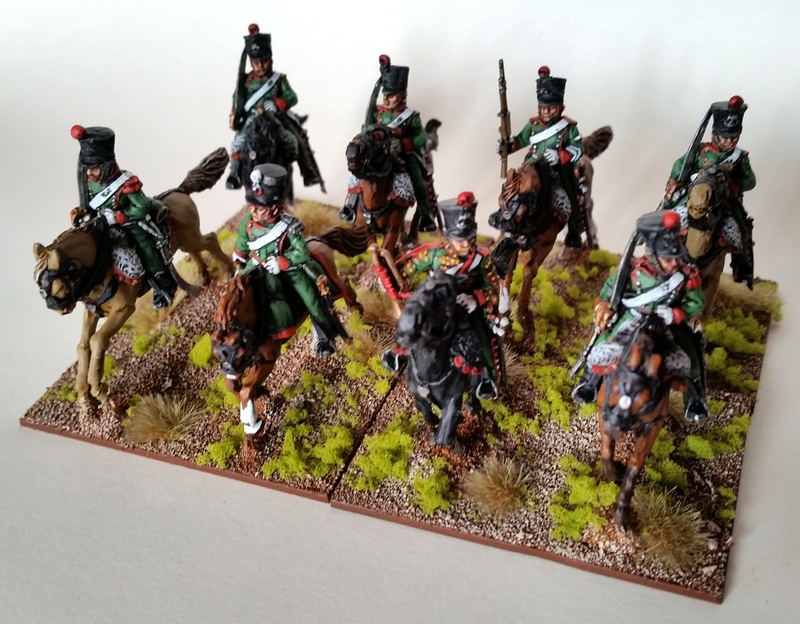 It’s been way too long – almost two years in fact, with the Lancers – since the last time I painted up some cavalry for my French, so with the bicentenary upon us soon I thought it high time to correct that matter! 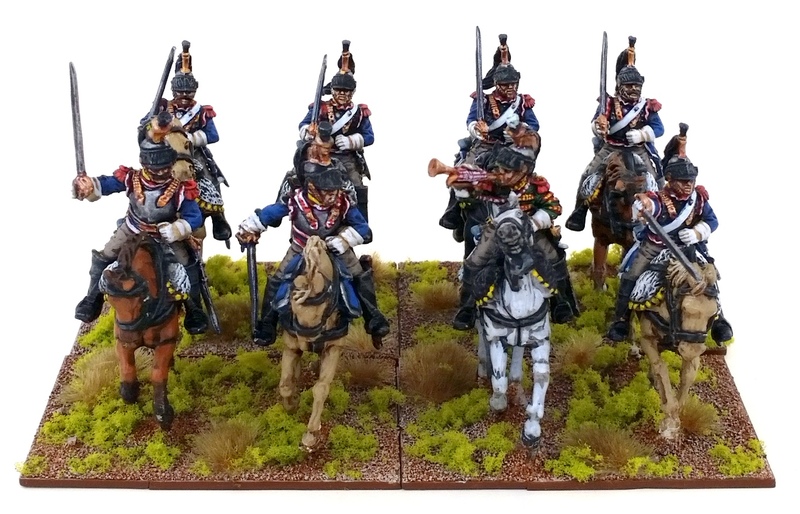 I picked up some Chasseurs-à-Cheval from Dave Thomas at Crisis ’14 which have been collecting dust since, but with Warlord Games now releasing their new plastics there was really no reason not to get going on these citoyens. En avant! Apologies for this first picture which somehow came out blurry despite the best of my efforts (and those of my camera), but I think you’ll get the idea. These are wonderful models. They share the same horse sculpts with the chevau-légér lanciers from the same range, I just wish there’d be more than three sculpts (beside those of the officiers). As you can see I alleviated the clone problem by using four different horse colours. 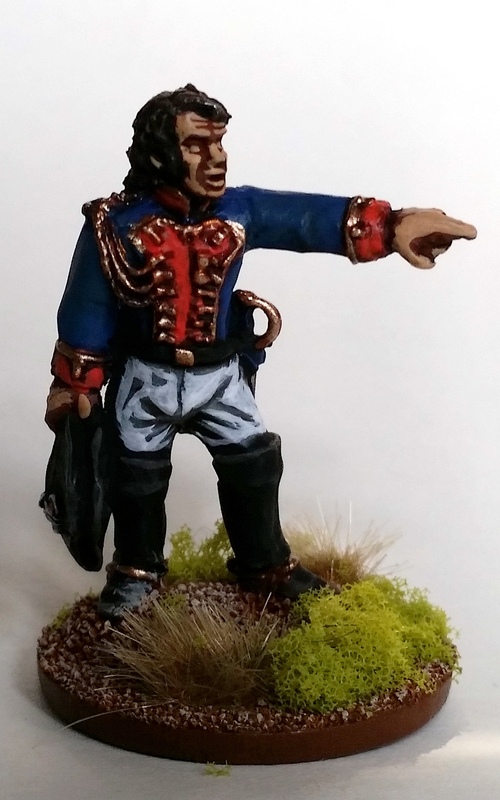 I didn’t include an eagle bearer, so I converted that model into a sergeant (or brigadier, isn’t it?) in the back rank with a plastic musketoon taken from a plastic dragoon. Easy! The rest of the command blister were used as supplied, plus two elite company troopers and a blister of the regulars. A trooper of the elite company with – naturally – a huge moustache. 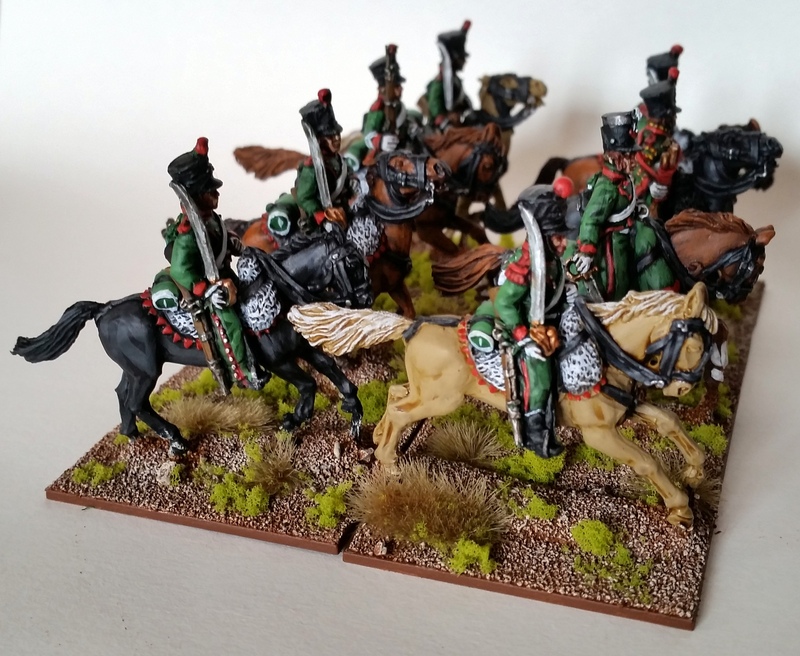 I made extensive use of colour primers – mournfang brown and zandri dust and black on the horses, and AP greenskin on the riders. Afterwards, some washes and highlights as per usual. Ready for the field of battle. 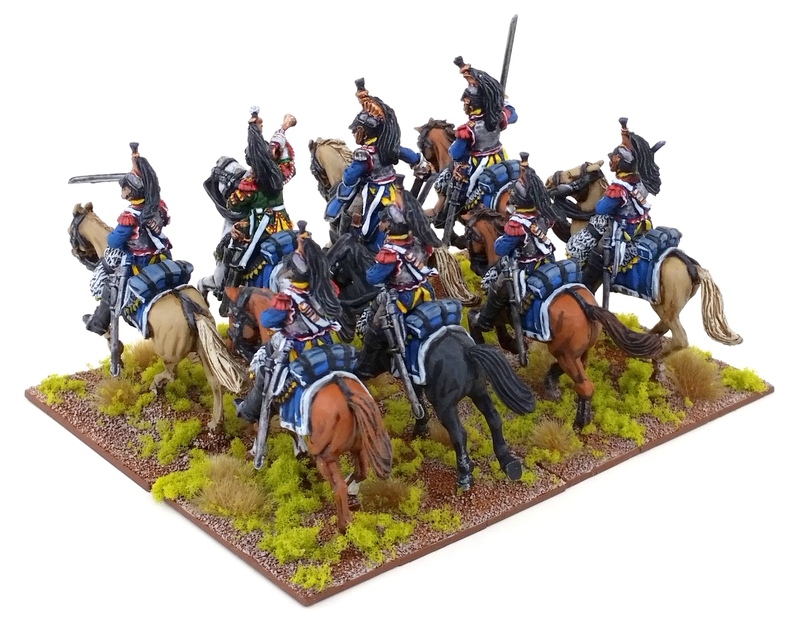 Now it’s a question of expanding upon this light cavalry section of the army; I need to find and paint up a suitable Comte Pire model, get some horse artillery ready, and more crucially I need one more regiment of Chasseurs and Lancers each! My wonderful girlfriend Eva treated me to some lovely stocking-fillers last Christmas, mainly Napoleonic in theme, and after completing the Belle Alliance I continued on my Napoleonic vibe by painting up Baron Larrey and the ambulance. Let’s take a look. First off we have Baron Larrey himself. I based him separately as I really like the focal qualities of the model. I like his pose; he really looks like he’s performing triage on the wounded. 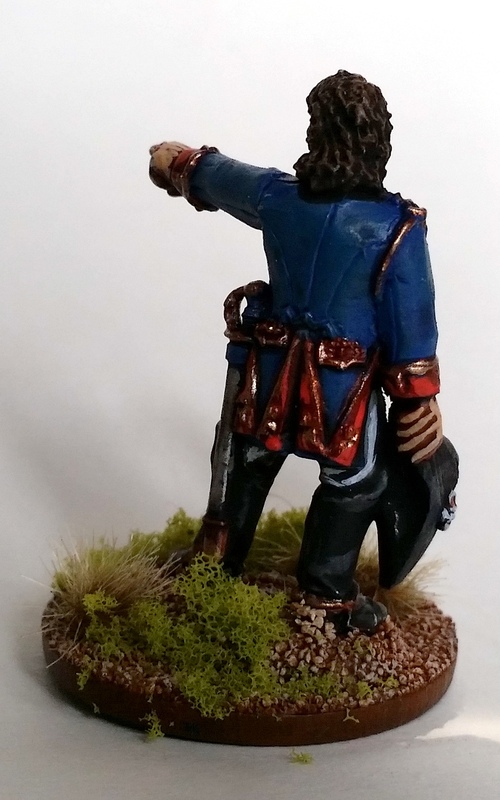 A rather bulky model – he looks like a prize fighter compared to my Perry infantry! As with the other humans of the kit, I worked from a macragge blue undercoat and worked up the colours as per my other infantry. 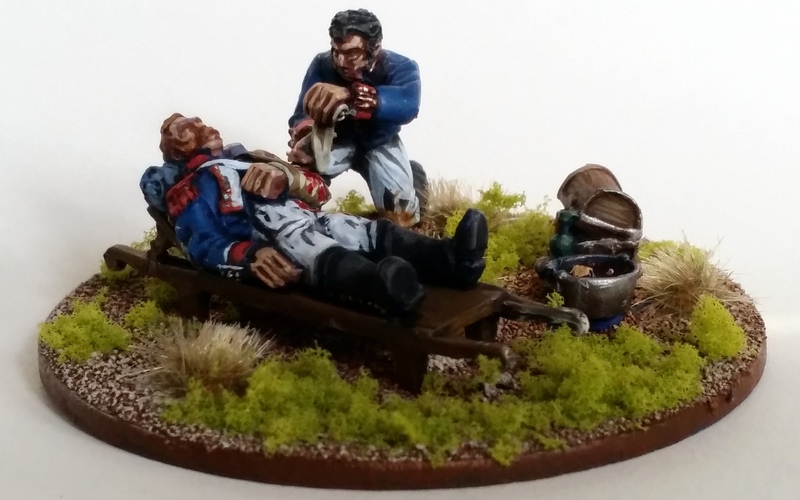 A nice little vignette which I’ll be using as a casualty marker. 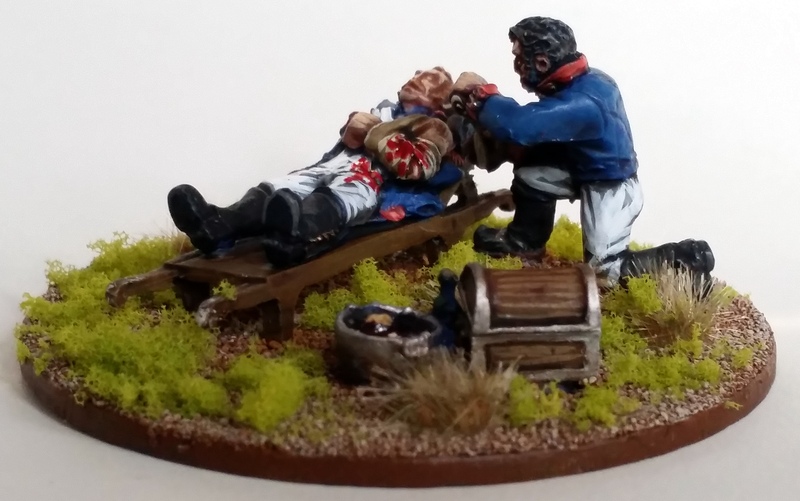 Next up we have a surgeon applying bandages to a wounded grenadier’s arm. These models have quite a bit of character and I really enjoyed painting them up. A sponge drifts in a bucket of bloodied water. Of course, I had to take out my GW blood for the blood god blood effect paint and go to town on the unfortunate grenadier’s arm. Might’ve gone a bit overboard with it, though. The cart itself is resin, which is the stuff of nightmares for me. Finally, here’s the ambulance itself. It was undercoated mournfang brown and basecoated XV-88 whereas the roof was basecoated adeptus battlegrey, then the brown was washed agrax earthshade and the metal and grey bits nuln oil. Some drybrushes later and I have a nice enough looking ambulance. 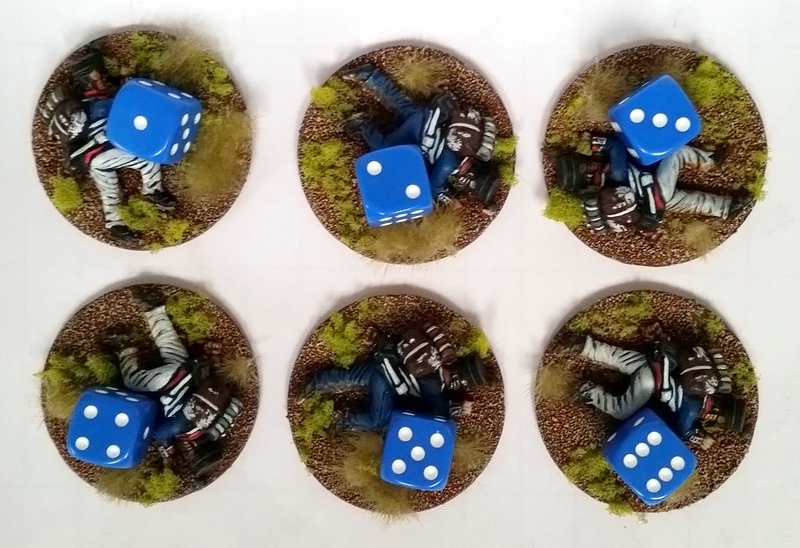 The loose models were mounted onto mdf bases from www.laserbases.be. For the cart itself I resorted to 3mm plasticard which I cut to a size conforming with my other basing – it’ll probably never be an issue, but I prefer some logic in such matters. 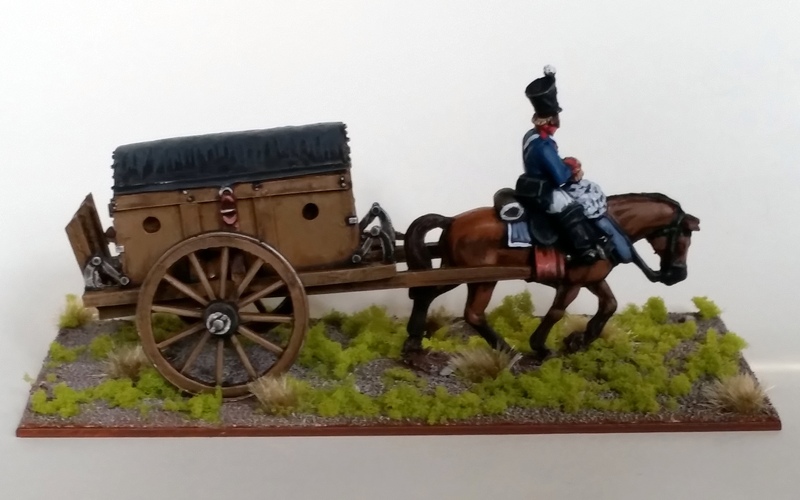 Et voilà, a nice centrepiece to my Napoleonic collection – that is, until I muster the courage to get started on Napoleon’s Berlin carriage! Up next: a few Crusaders, more Prussian Landwehr and the start of yet another small commission.